"Sampath Speaking" - the thoughts of an Insurer from Thiruvallikkeni: Justin Gatlin runs 100M in 9.45 sec ~ but still Usain Bolt's 9.68 is the fastest !! 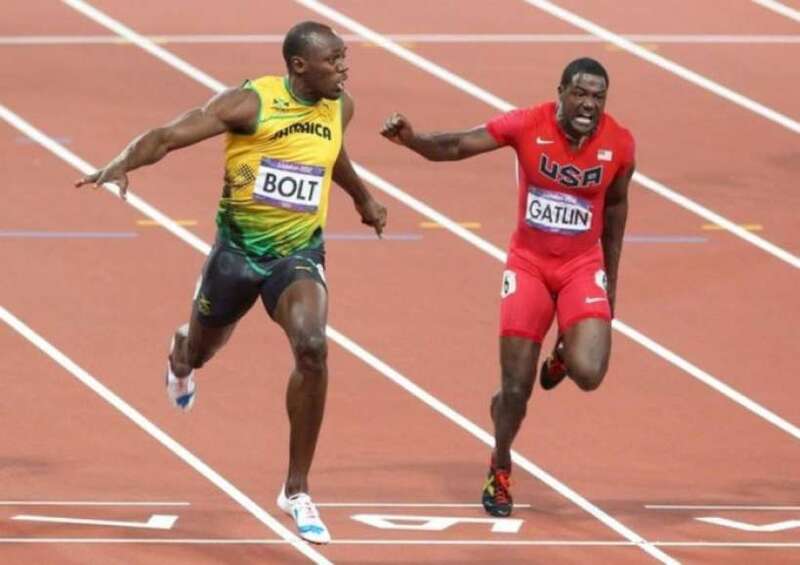 Justin Gatlin runs 100M in 9.45 sec ~ but still Usain Bolt's 9.68 is the fastest !! My favourite writer genius Sujatha wrote a novel in Kumudam titled ’10 second mutham’ – a story of an Indian female athlete who is trained to break the barrier of 10 seconds and her emotional relationship with the coach formed the nucleus of that story. Olympics at Beijing in 2008 was all about Usain Bolt. In the 100M final, Bolt broke new ground, winning in 9.69 seconds. Later he cut a few more seconds out of that. 9.58 is the World Record and 9.69 is the Olympic record in 100M and both belong to Bolt. At London, there was to be no challenge as Usain Bolt emphatically confirmed his status as the greatest sprinter in history retaining his Olympic 100m title in peerless fashion. … the interesting news is ‘Justin Gatlin has smashed Usain Bolt's 100m world record’, however it won't count !!!! – the American covered the distance in an incredible 9.45 seconds, well under Bolt's 2009 record of 9.58 seconds. It was part of a stunt for Japanese game show Kasupe! in which the 34-year-old, who is considered Bolt's main rivals for glory at this summer's Olympics in Rio, agreed to take part. Gatlin's start was boosted by a huge turbine that propelled him from the blocks and was then assisted along the way by smaller fans placed at the side of his lane. Gatlin recorded the fastest time ever beating Bolt’s 9.58 Berlin show to finish in 9.45 seconds. It was always going to take something special to beat Usain Bolt's unfathomable 100m record, but sprint rival Justin Gatlin has recruited a secret weapon ahead of their showdown in Rio this summer. Gatlin was backed by a wind machine blasting 20mph gusts down the track as he hurtled towards the finish line in 9.45 seconds. It should be a grand morale booster for the 34-year-old as he prepares to set off from the blocks challenging Usain Bolt. This feat would not count as the huge tail-wind was more than four times the legal limit for competition. That however, did not stop the assembled Japanese crowd on the sidelines from letting out squeals and jumping to their feet and clapping the American. Gatlin, whose personal best over the distance is 9.74 seconds, played along - handing out high-fives on the TV show. Gatlin returned from a four-year doping ban in 2010 and has emerged as Bolt's main rival in recent years. Last year's World Championships in Beijing were dominated with the Bolt vs Gatlin build up after the 34-year-old had dominated the sprinting season. Bolt will be looking to win his seventh, eighth and ninth Olympic gold medals this year; Bolt trounced Gatlin and in the 200m final in Beijing, which is the Jamaican's favourite event ~ and Gatlin is speaking of a win. The stunt of Gatlin was only meant as a bit of fun, his involvement in an artificially enhanced performance might be considered crass. In 2001 he was banned from athletics for testing positive for amphetamines and then was kicked out of the sport again in 2006 for doping.